Luckily the dream wasn't that of an unsuspecting person who turned to a psychic for help - this time it was Robbie Thomas proving that he's not psychic. A few weeks ago I had posted some information about what Robbie Thomas (and friends) are up to these days. Leaders in their field, this team of experts will explain the unexplainable and have fun doing it. Often putting their lives on the line to get scientific proof of the the existence of the paranormal, these explorers will bring you the latest in scientific evidence from around the world. For their first expedition, they will travel 20,000 miles to bring you proof of the existence of extraterrestrials and UFOs. The project, on Kickstarter, was seeking $20,000 in funding for the project to get off the ground but, shortly after Sarnia Skeptic posted the following comment on the site, the project was canceled by the creator. Is this the same Robbie Thomas as featured on http://www.robbiethomastours.com/?? 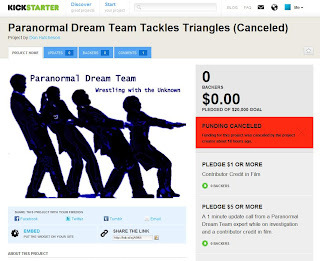 A double strike against our "Paranormal Dream Team". I guess they failed to predict that it would be a massive failure. Not even a single dollar was contributed (Sarnia Skeptic told me that he had planned on donating $1 to it but when he returned today, it was canceled). Robbie Thomas is not psychic, has never solved a missing persons or murder case using his claimed psychic powers and, until he produces evidence to the contrary, any claims that he has should be considered lies.